The University of Florida today celebrated the opening of the Clinical and Translational Research Building, a new home for research that will speed scientific discoveries to patients. The $45 million, 120,000-square-foot complex will spark collaboration and spur medical advances by bringing together research teams from a range of scientific disciplines. The building, which overlooks UF’s historic Wilmot Gardens, houses the UF Institute on Aging, the Clinical and Translational Science Institute, or CTSI, and an array of other academic departments and clinical research programs, as well as flexible conference, training and collaboration areas. The almost 40,000-square-foot Institute on Aging complex is funded under the American Recovery and Reinvestment Act of 2009 through a $15 million grant from the National Institutes of Health. The adjoining 80,000-square-foot portion of the facility is funded by a $30 million bond, which will be paid back by the College of Medicine and College of Public Health and Health Professions using a portion of research grant funds reserved for covering facilities and administrative costs. The Institute on Aging’s one-stop facility makes it easier for mobility-restricted older adults to take part in clinical trials and strengthens connections among existing UF research centers, including the Claude D. Pepper Older Americans Independence Center, the CTSI and the Cognitive Aging and Memory Clinical Translational Research Program. The facility also houses the UF Health Senior Care geriatric medicine practice, which provides consultative, preventive and primary care for adults age 65 and older. “When I came to UF eight years ago, with the strong support of UF’s leaders we built an academic home for the Institute on Aging — now we have built a physical home, which has brought together researchers from various fields of expertise, to facilitate the kinds of cross-pollination of ideas that drives scientific progress,” said Marco Pahor, M.D., director of the UF Institute on Aging and chair of the department of aging and geriatric research in the UF College of Medicine. 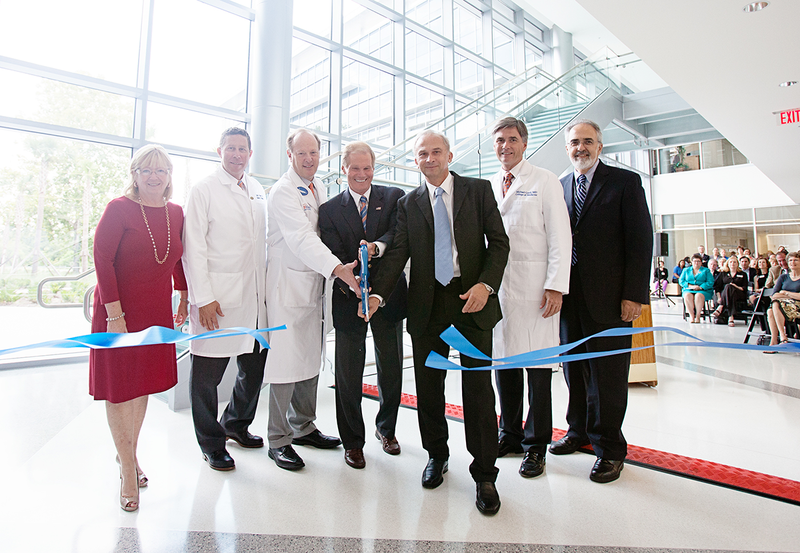 The CTSI, which also is headquartered in the new building, serves as the hub of a large research network that connects UF’s 16 colleges, the UF Health academic health center, the North Florida/South Georgia Veterans Health System and collaborators across the state and nation. Its Clinical Research Center facilitates adult and pediatric research in areas such as diabetes, muscular dystrophy, rare and genetic diseases, metabolic syndromes, liver diseases and pain. The CTSI wing also houses the departments of epidemiology, biostatistics and health outcomes and policy. 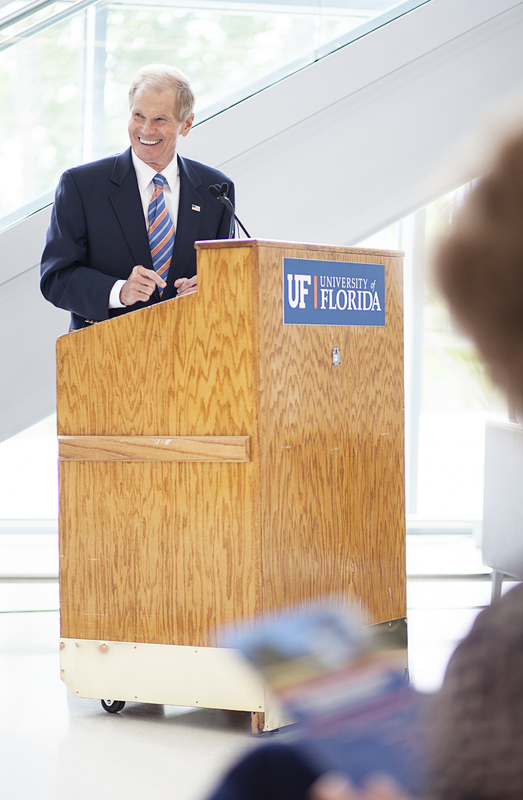 “This building is the physical embodiment of a big idea — that by bringing together diverse scientific disciplines, research teams and research participants under one roof, we can expand collaborations at UF and statewide that speed scientific discoveries toward better health,” said David R. Nelson, M.D., assistant vice president for collaborative research in the life sciences and director of the UF Clinical and Translational Science Institute. Studies have estimated it takes an average of 17 years for scientific discoveries to reach medical practice. The Clinical and Translational Research Building represents the full spectrum of research required to shorten that gap — from discovery to clinical application to implementation and dissemination. Designed to meet the highest sustainability standards aimed at conserving resources, reducing pollution and making indoor spaces conducive to good health and well-being, the new facility has been submitted for the highest level of certification, Platinum, from the Leadership in Energy and Environmental Design, or LEED, program of the U.S. Green Building Council. The building incorporates features to improve indoor air quality through the use of low-emission building materials; efficient energy production and use through photovoltaic cells and light sensors; and water conservation technologies. The construction phase included measures to prevent construction activity pollution.